It’s amazing what you can do with a little rock, water and patience. Well, a little water, a lot of rock and all the patience in the world, I suppose. Plenty of places talk about the caves they have but few have managed to entice me in. Cave geology may be impressive but, let’s face it, caves by their very nature are dark, dank and dangerous and I’ve cracked my skull enough times to have generally lost enthusiasm. 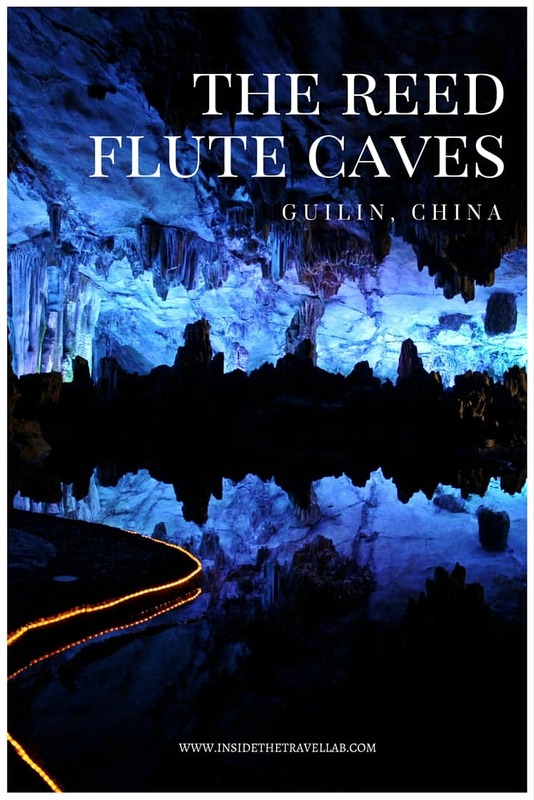 Yet China’s Guilin province has come up with a better plan for its Reed Flute Caves. 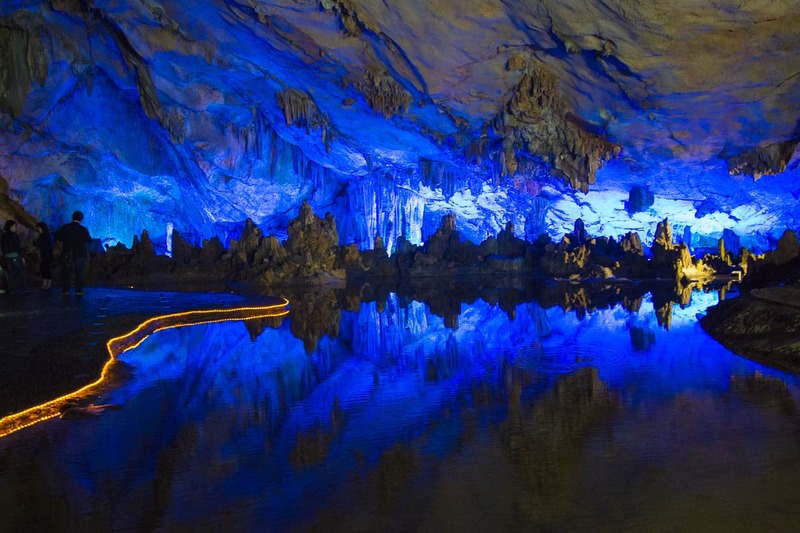 A luxury cave plan: snazz up 180 million years of drip-drip-drip with 240 metres of illuminated walkways. Stalactites in red. Stalagmites in blue. Rippling water. Dripping water. Calm water. Names that bring their countryside and culture to life through poetry: the Virgin Forest, Crystal Palace and Dragon Pagoda, to name a few. Plus my favourite, the Mountain of Flower and Fruit. At the entrance, the poetry persists. Floating parasols decorate the tree tops in pops of sunshine yellow and orange among the green. Even the name joins in, with locals imagining the rock could be spirited into the air and music of reed flutes themselves. It’s a place of slippery illusion. And words. Scripted, swirling words that date back to the Tang Dynasty and the year seven hundred and ninety two. 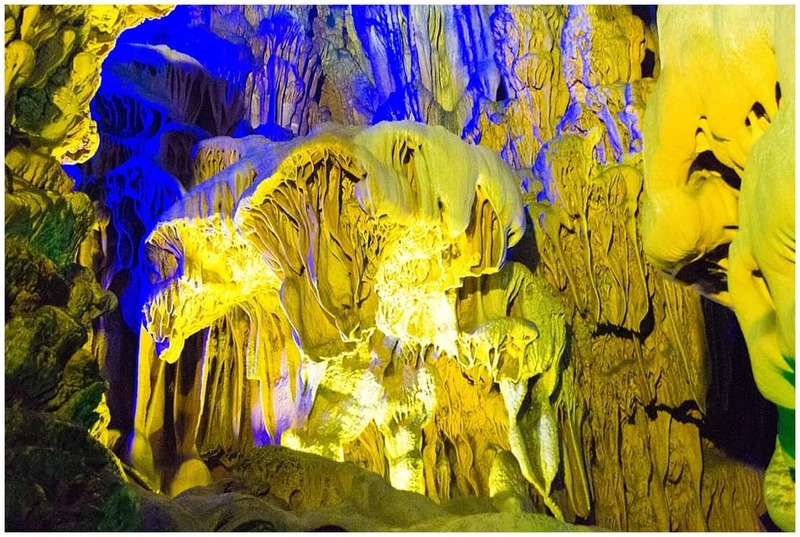 Words that tell us that travellers came to visit Guilin’s largest cave network well over one thousand years ago. And for once I can see why: they are surprisingly beautiful caves. I travelled as part of my itinerary with China Odyssey Tours – but it’s also possible to travel independently by bus. Find up to date information on reaching the Reed Flute Caves here. Updated 2018. I visited the caves as part of the #dragonroute with Cathay Pacific UK and travelled with China Odyssey Tours. Free to write whatever I like. As usual. As ever. As always. 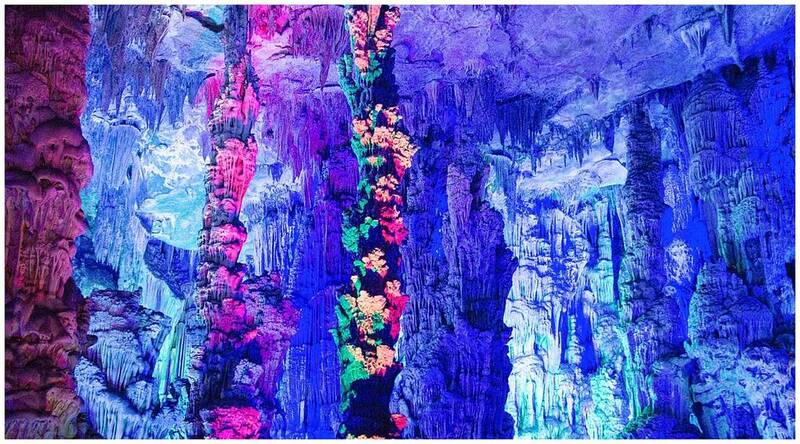 My dad went to China a couple years back and he came back raving about the caves of Guilin and how beautiful they were. I was all like: “Yea, okay, dad, sure”, thinking how beautiful could a cave get. And then I saw this post and realized how wrong I was! Ooohhh boy! Particularly love the parasol images. They’re enchanting! into better perspective for me the enormity and magnificence of our wonderful planet that humanity is continuing to destroy at an ever increasing and escalating rate. you have clearly mastered and honing on a daily basis. 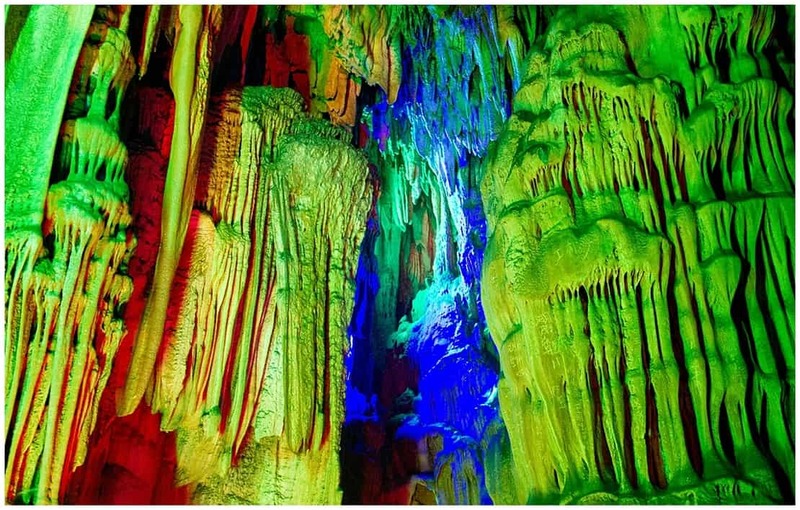 I am planning on visiting these caves… any recommendations on how to take the best shots in the cave lighting?